Collection Factory now uses Joomla's nested category model, allowing unlimited levels of categories and subcategories, supporting a name, description and an ordering system. By going to Categories page, the administrator can view all available categories along with their description. As available actions, the administrator can set their order, publish or unpublish them, edit by clicking on each category or delete them. It is important to know that making a category or subcategory unpublished which has published items inside, will also make the items not visible on the frontend. In case you choose to delete a category or subcategory, the existing assigned items will become unassigned but will still be visible on the frontend. Along these, there are additional tabs which allow the administrator to configure the category even further. This function can also be used to move a category or subcategory, allowing complete flexibility inside the category tree. For this, while editing, simply choose another parent category using the drop-down menu found on the right side of the page. To save the new category or the changes made after editing, just press the "Save" button, found at the top of the page, on the left side. 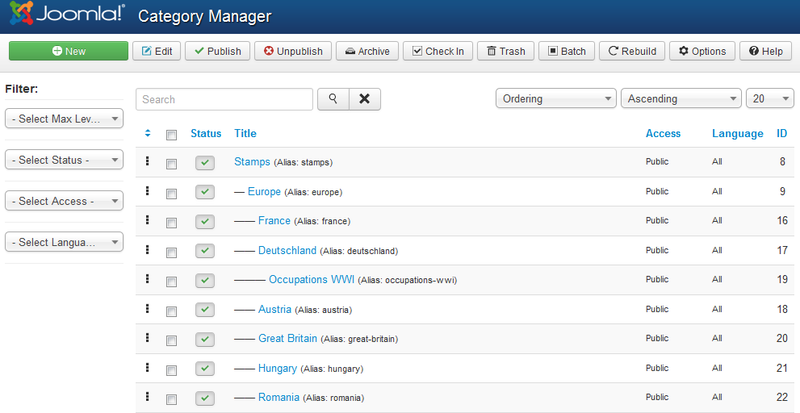 The Currency Manager page allows the administrator to manage the currencies used for item prices. You can select a default currency to be used on payments, add a new one, delete them or change their conversion rate. Clicking on New will allow you to add a new currency. Simply add the currency abbreviation and a conversion rate. In case you don't know the conversion rate, you can leave the field empty and click on Refresh conversion later on, in order to update it. The CRON script also updates currency exchange rates according to Google. Check the CRON documentation for more.